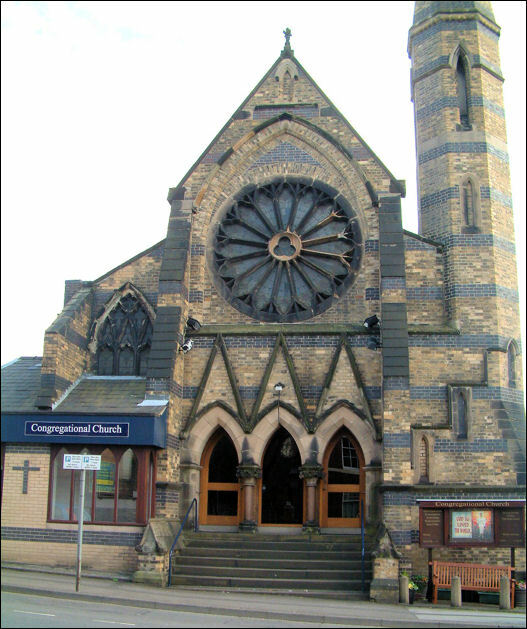 "NEWCASTLE UNDER LYME SJ8546SW KING STREET 644-1/9/70 Newcastle Congregational Church II Church. 1859, restored 1990. Buff brick striped with broad bands of blue stone dressings. Slate roof. Decorated style. Main range with thin turret to right. INTERIOR not inspected but reported as retaining original fittings, though part screened off." 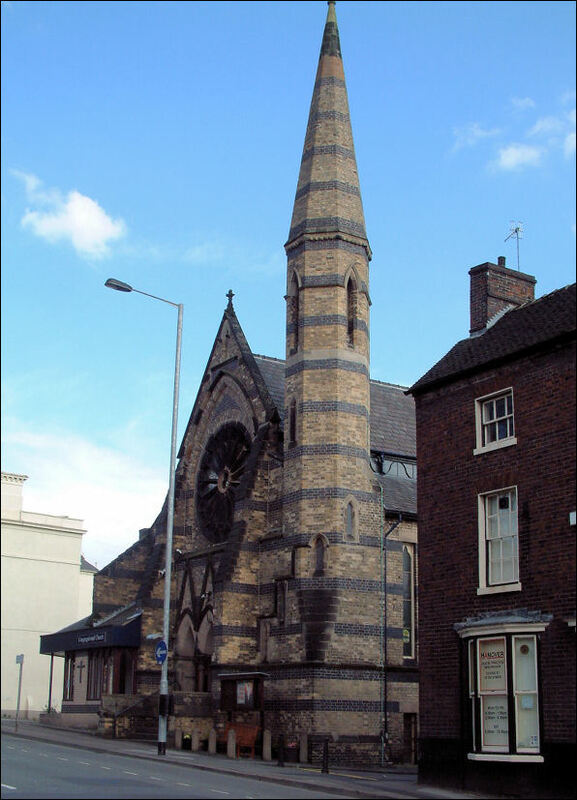 "This interesting example of evangelistic extravagance is the Congregational Church in King Street, Newcastle. It is built from yellow brick, with regular layers of blue, and various stone embellishments. Among its main features are a pleasant wheel window, a three arched entrance, various buttresses, and a prominent octagonal tower. I find it an exciting piece of Mid-Victorian eccentricity and a very welcome relief from current monotony. Congregationalism was originally a form of church government adopted by Protestants who chose to manage their own affairs. In 1672 a Declaration of Indulgence allowed dissenters to hold services in houses that were registered for worship, and in Newcastle the Congregationalists joined with the Presbyterians in establishing ministerial training. In the 1770s, Captain Jonathan Scott injected new life into Newcastle's movement. His popularity continued to grow in North Staffordshire and South Cheshire, and he attracted many benefactors. One such patron was Lady Glenorchy whose support enabled him to run an academy in Newcastle between 1783 and 1792. 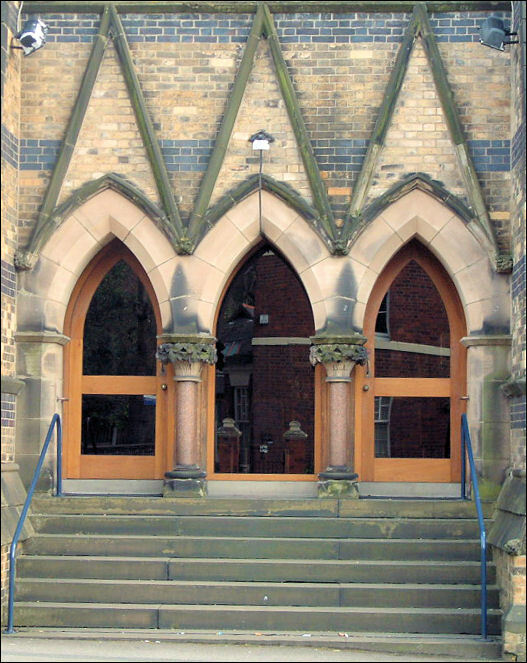 During this period the movement founded one of the first Sunday schools in the county. 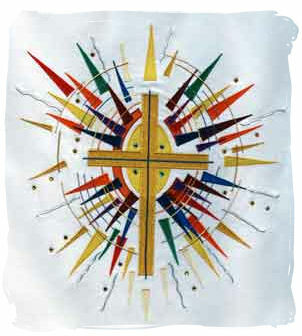 In 1784 his congregation built the Marsh Chapel which was replaced by the present Congregational Church in 1859." A group of Christians began to meet in Newcastle in 1776 under the leadership of a Cavalry Officer, Captain Jonathan Scott. He married a pious society woman of wealth, Elizabeth Cley, of Shropshire and with her resources, and those of Lady Glenorchy of Scotland, he worked to found several independent congregations in Staffordshire, including one at Newcastle. Our baptism register goes back to 1777, and the Church was formed by a 'covenant' or solemn agreement, in 1782. 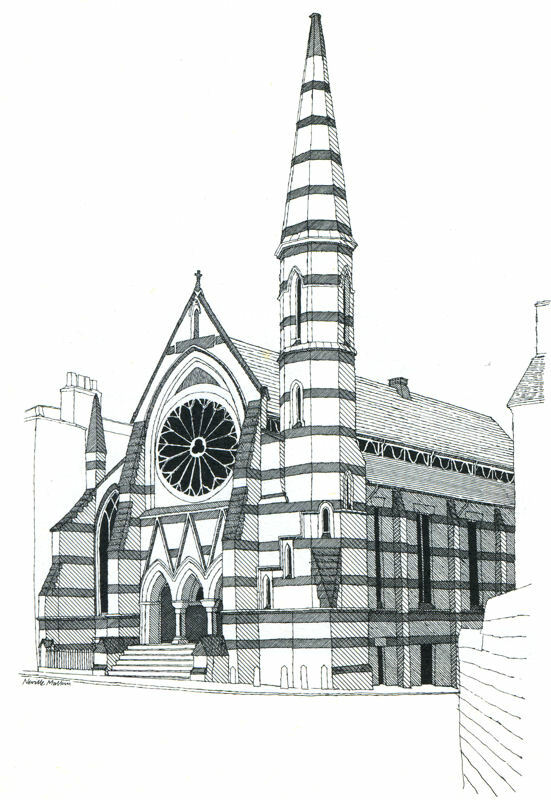 A brick building was erected on the present site, and it was known as the Marsh Chapel, because of the nature of the ground. In 1859 that was replaced by the present structure, which has been described as 'an architectural eccentricity'. It is, however, full of charm and is 'listed' for its special qualities. In recent years a great deal of work has been carried out to give it a new roof, a special entrance for the handicapped, and a much improved lower hall.